Deciding on the handle style for the mid century dresser wasn’t easy. 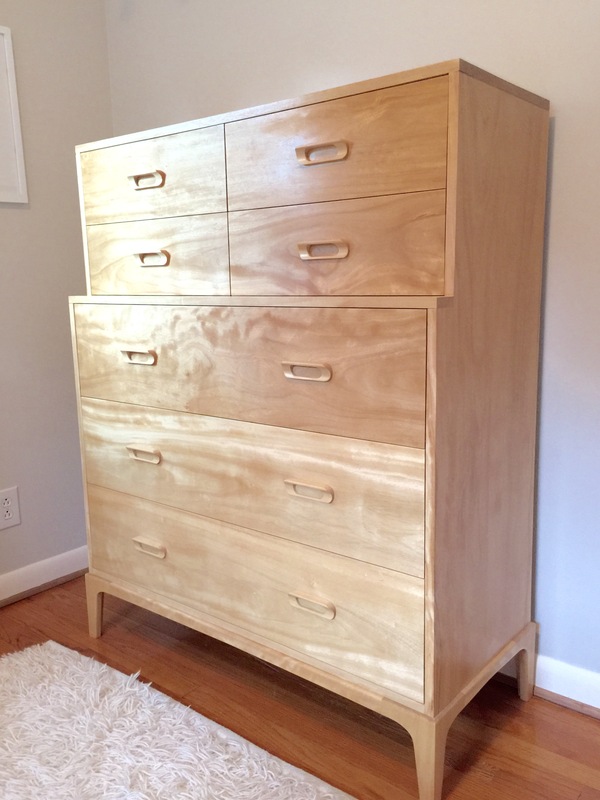 I knew that I did not want metal hardware – there are certainly some styles that go with the design, but it just seemed too easy to bolt them on to the front of piece and call it done. 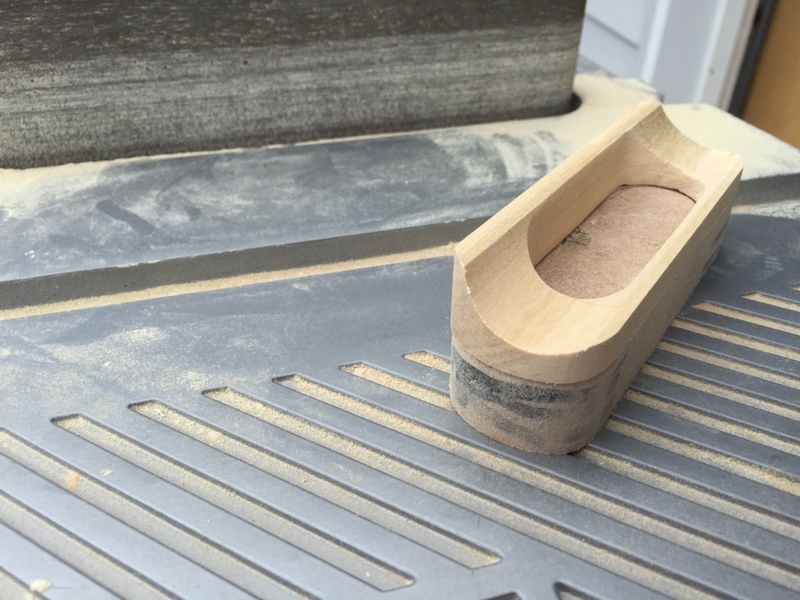 I briefly entertained the idea of buying pre-made wooden pulls that would require insetting, but since there was no way I would find them in avodire I would have to settle for a different species (likely maple) and hope they would finish up in the same color. With as much effort as I put into the construction of the piece, it was easy to decide that this was not an option. 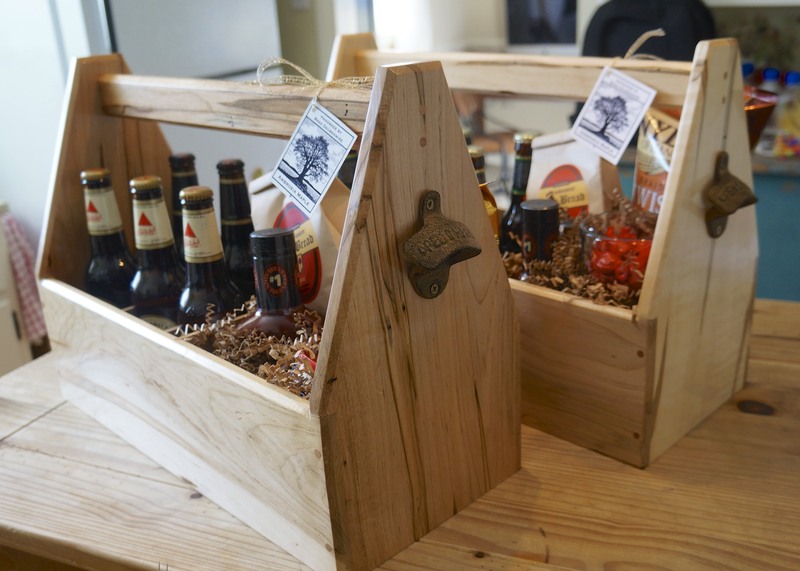 It was clear that I needed to make the handles – but I did not want them to look “homemade”. If that makes any sense! Rip 3″ strips of 3/4″ thick stock. 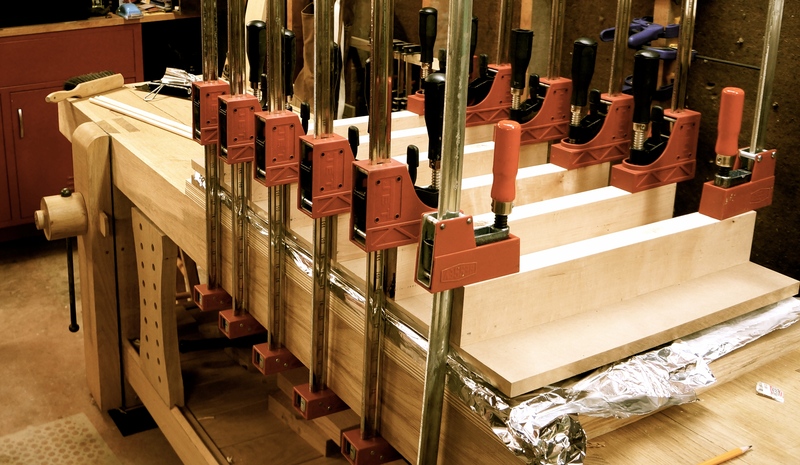 To keep workpieces large enough to work safely on power tools, I made 4-5 handles per length of board. Center waste is removed before cutting into individual handles. Mark the ends of each center void with a square. I flexed a business card to carry the lines inside the coves. 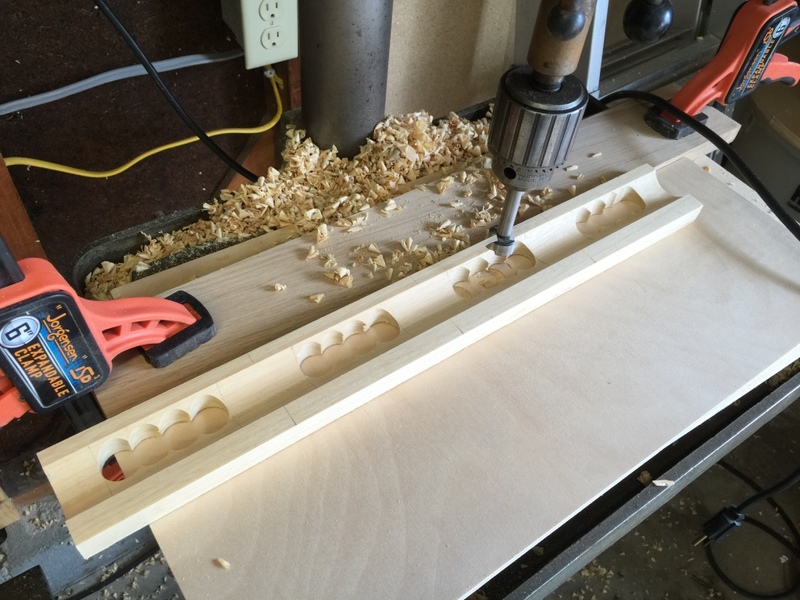 Use a 3/4″ Forstner bit to remove most of the waste on a drill press. Note, the void is not centered in the cove, it is about 1/8″ or so from one edge of where the cove starts – this is the top of the handle. Use a back stop to ensure the drill path is straight. Use a chisel to pare away remaining stock in the void. To prevent long-grain tearout, pare very thin slivers. Do not chop directly to the line! Experience…. Rasps and sandpaper finished the interior shaping. 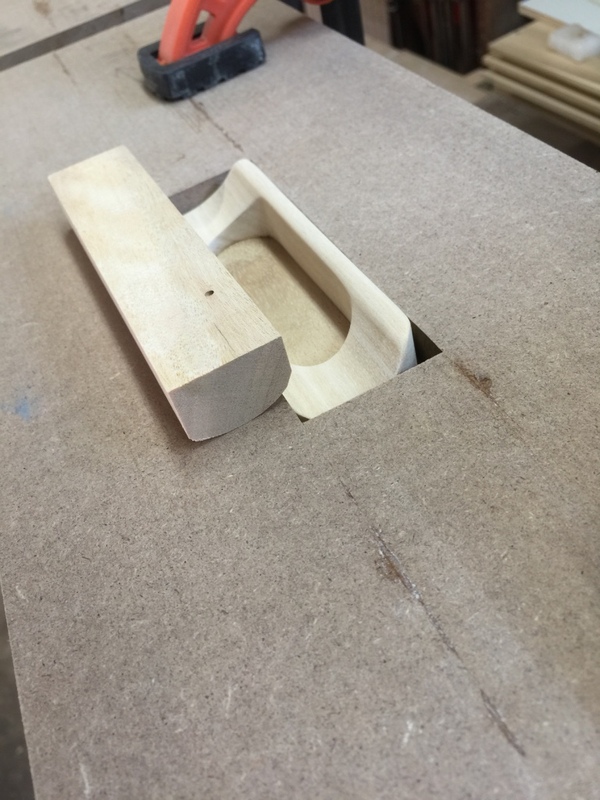 My Moxon vice worked great for holding the work in position. Cut to final height on the table saw. 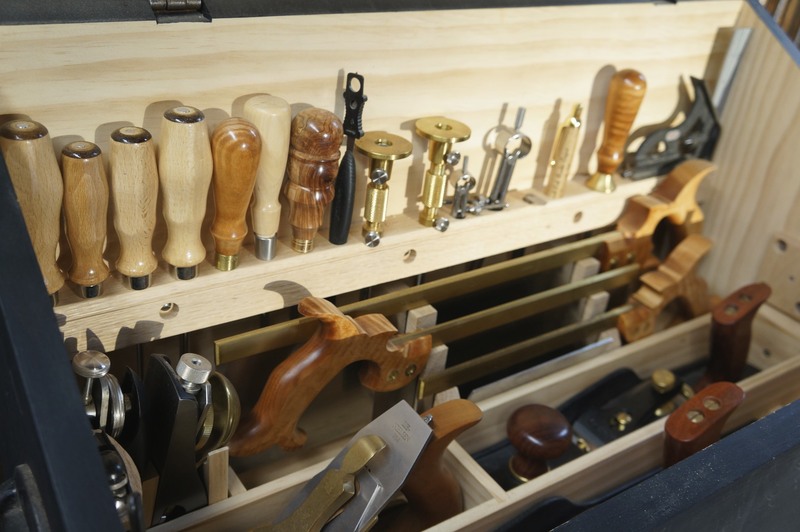 The top cut is actually a 7 degree angle, leaving a comfortable wedge shape grip to the handle – it gets thicker the closer it is to the drawer front. 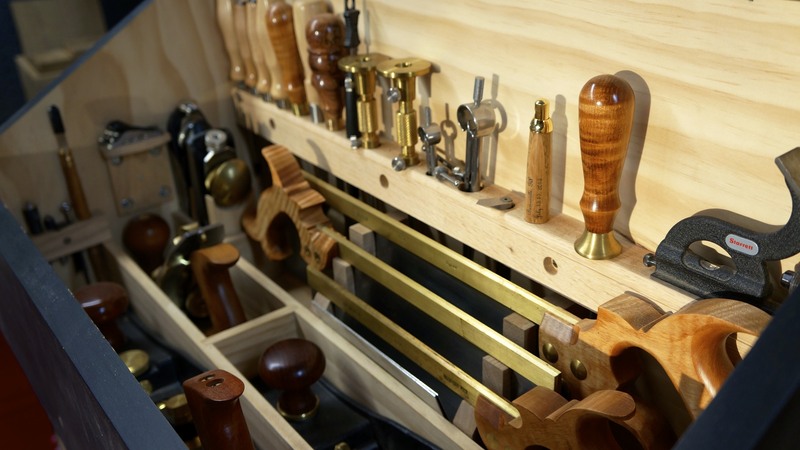 Round over the handle grip and knock down the bottom lip of the cove with a block plane (the top of the handle protrudes a bit further than the bottom. Cut the long pieces into individual handles. 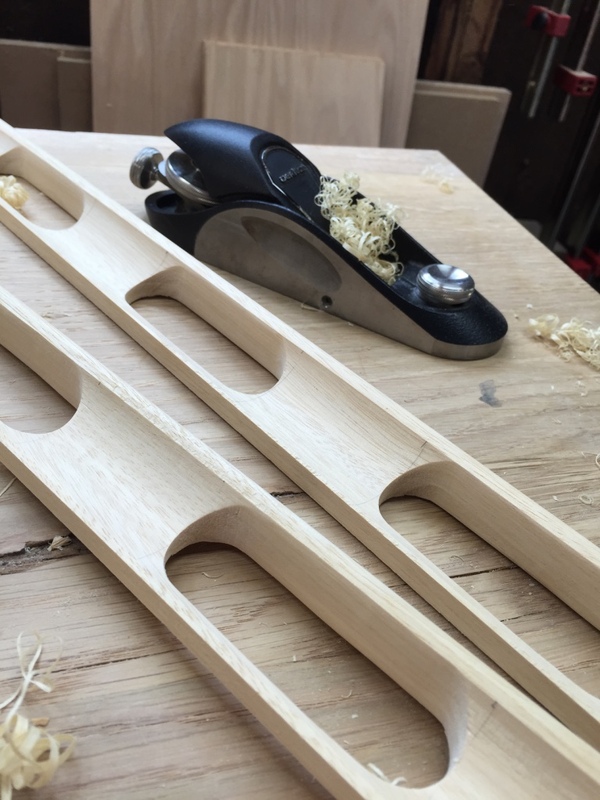 For consistent width, I just made some marks on my cross-cut sled for reference. Finally, more rasping and sanding to to get to final shape and finish. 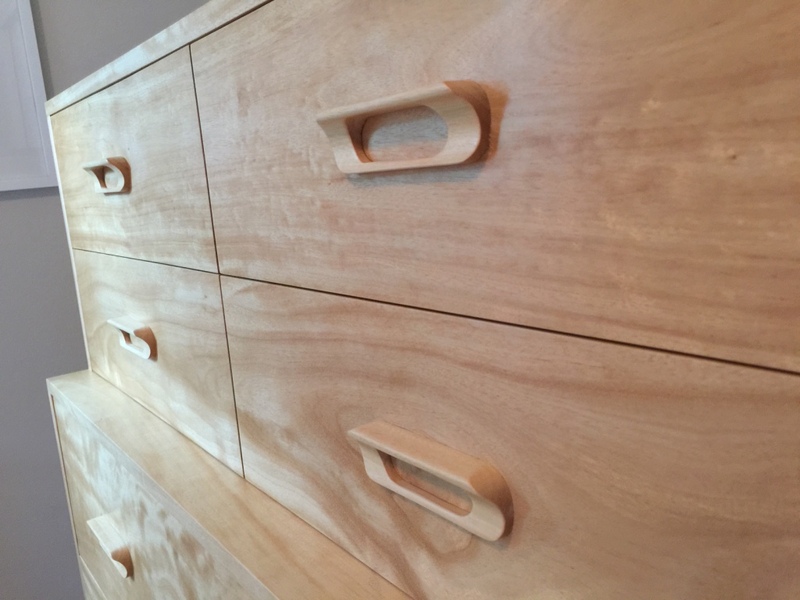 I made a couple templates from MDF – one for the left side of the drawers, the other for the right (and marked accordingly). 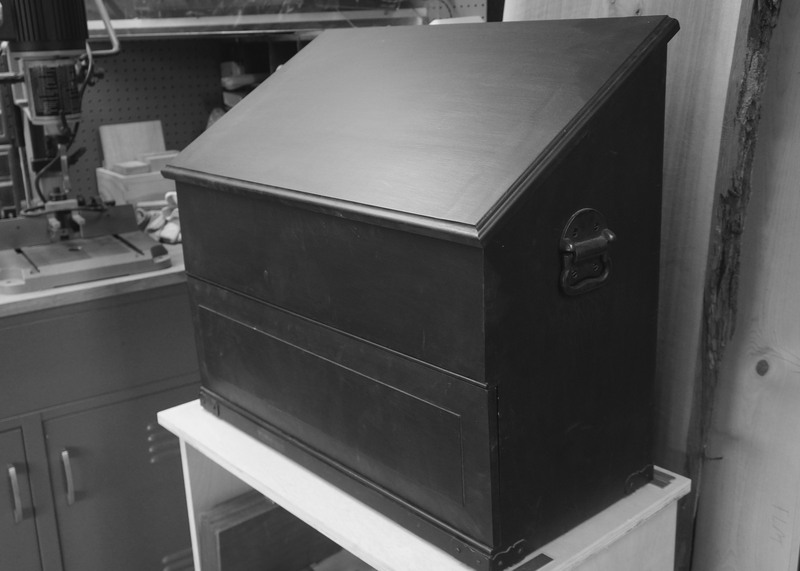 Rather than trying to cut a perfectly size void in the middle of a single piece of MDF, templates were made to the exact size of the top drawer fronts using four pieces each, carefully cutting the center strip to the width of the handles, then gluing together using one of the handles to space the void properly. Made a couple of cauls from scrap blocks of wood. I just used a block plane to mimic the cove in the handles, which nested into the handles with precision (almost like I planned it!). 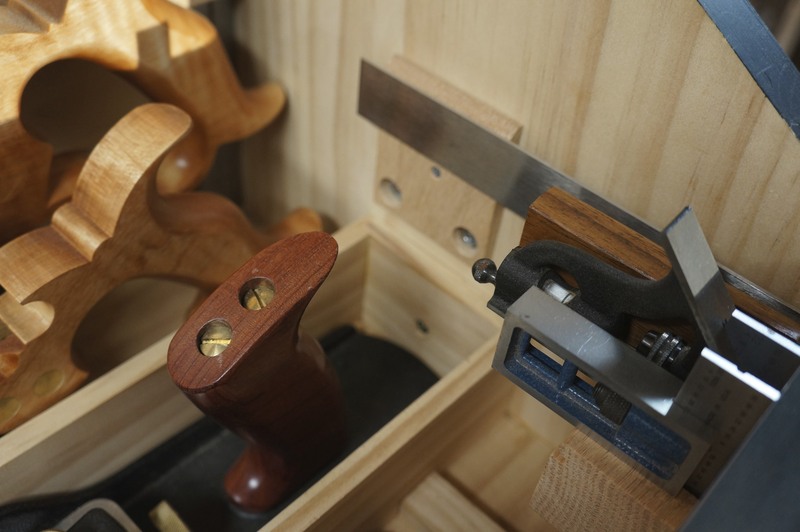 With the flat side up, I could clamp to the drawer face with good, even pressure. 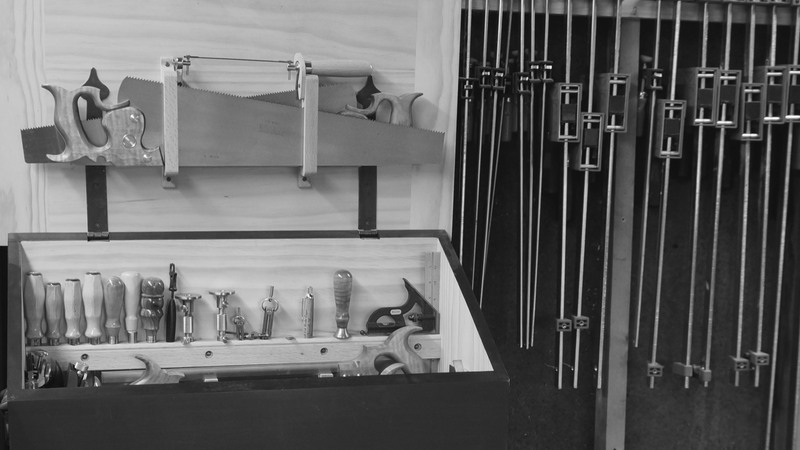 Clamped the templates to the drawers, carefully aligned. 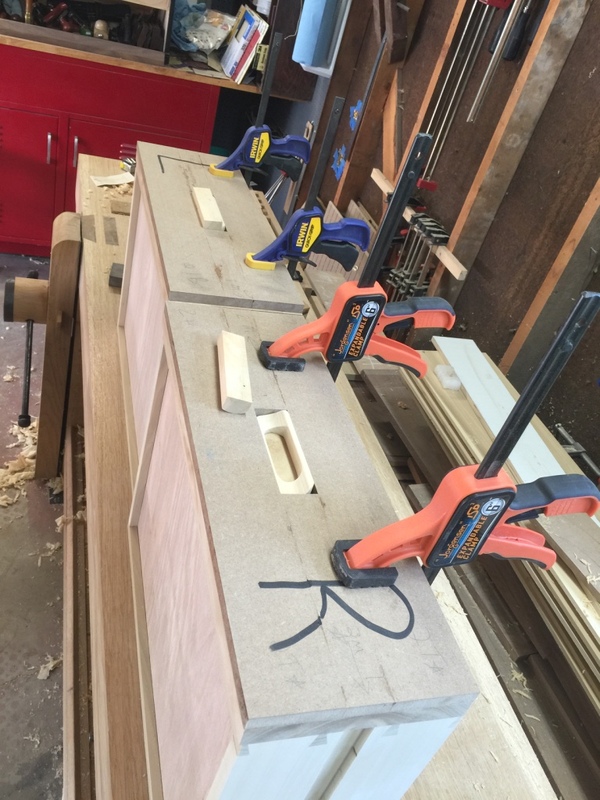 From there simply applied glue to the handles and placed into template, dropped in the cauls, and clamped. I needed a fair amount of throat clearance to get to the cauls, so a couple old school wooden twin twists did the trick. With two templates I was able to making quick work of the process. 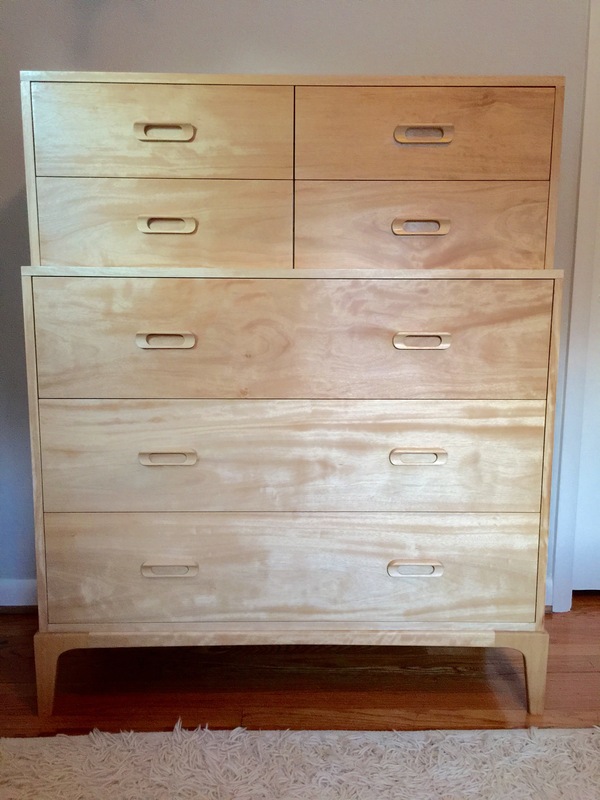 I am glad I decided to make these, they enhance the dresser very well. 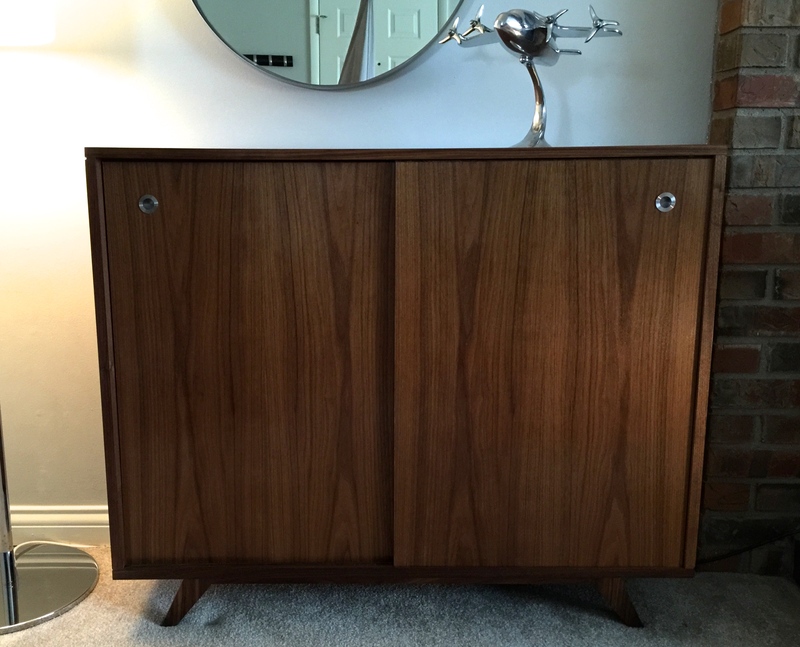 I recently finished a couple of mid century cabinets in walnut for our family room. Nicole and I like the clean lines of this style, so we modeled the design from pictures of a few cabinets we liked. 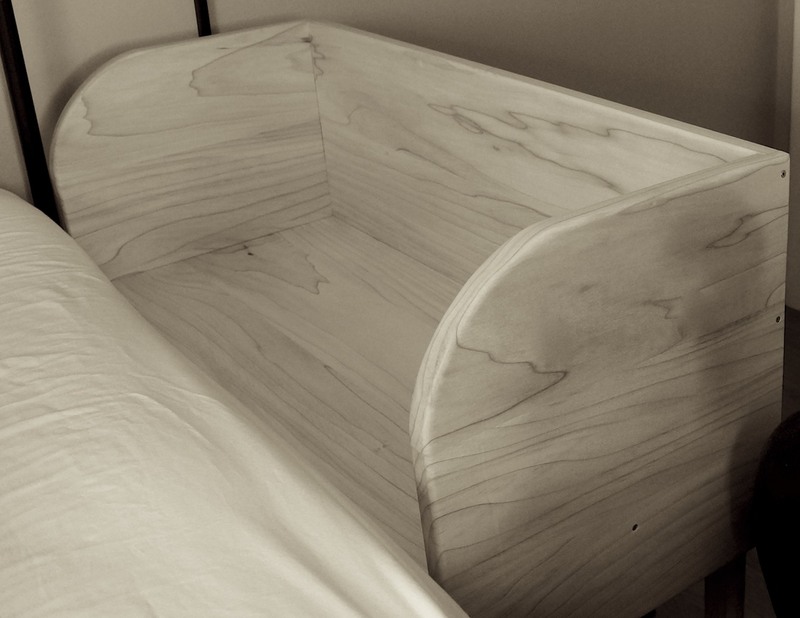 The final dimensions were based on the space they were to occupy, along with the wood itself. 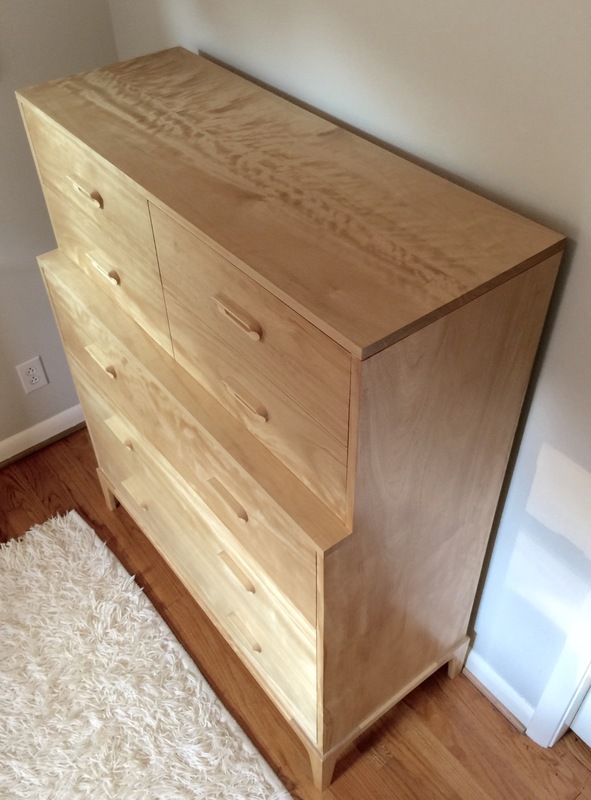 The smaller piece has a couple drawers and sliding panels to hold incidentals when coming and going from home (keys, glasses, diaper bag, hats, etc.) and the larger has only sliding panels to hold our daughter’s books. 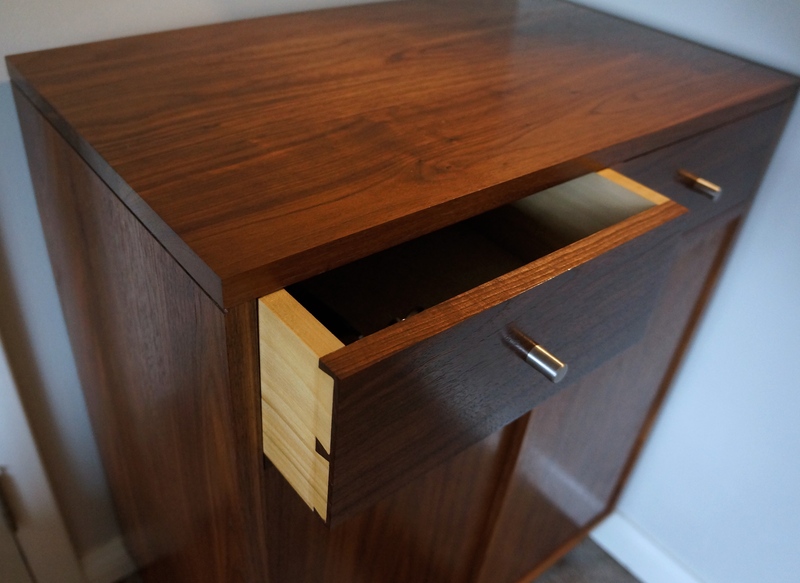 The sliding panels are 1/2″ ply veneered with Italian Walnut from Veneer Supplies. 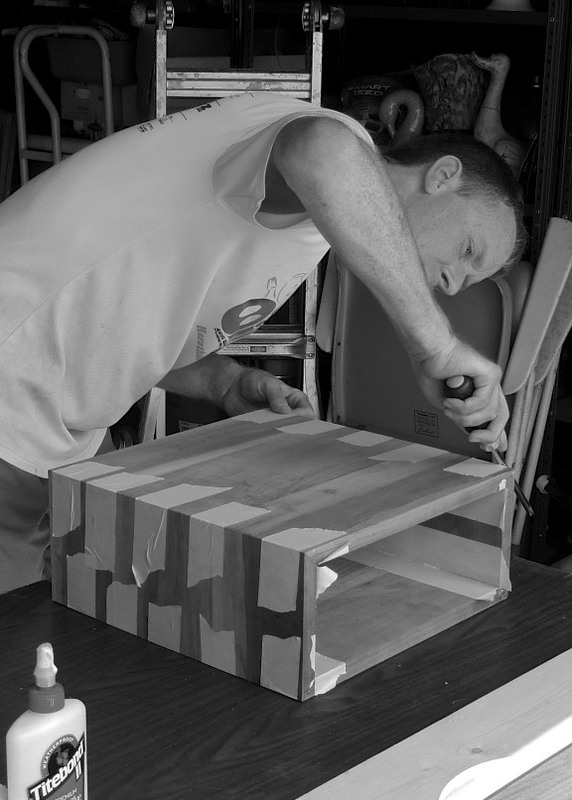 This was my first go at veneer work – once I understood the process was surprised at how straightforward the work was. For the smaller cabinet panels I used a manual vacuum press from Lee Valley with a couple MDF platens. These were notched with table saw kerfs to allow for efficient air removal and even pressure, which worked well. 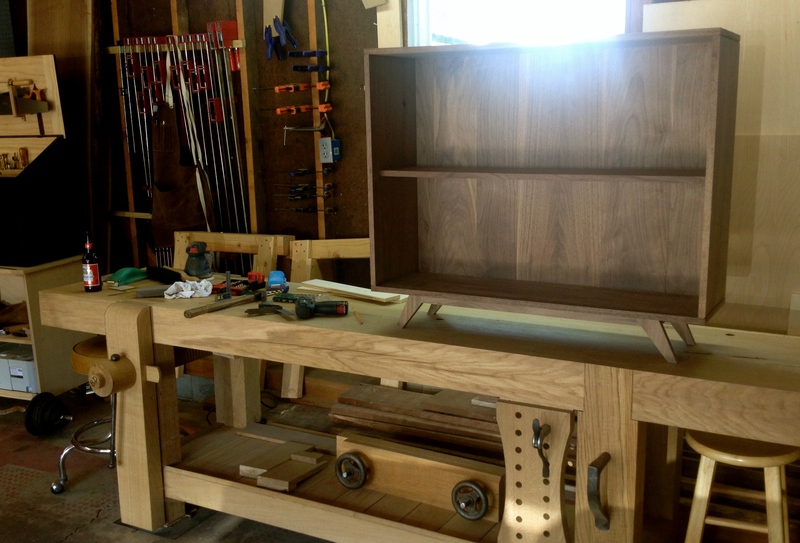 The panels for the larger cabinet were too big for the bag – for these I used my workbench as a flat reference with the panels between plywood platens and clamped with maple battens. 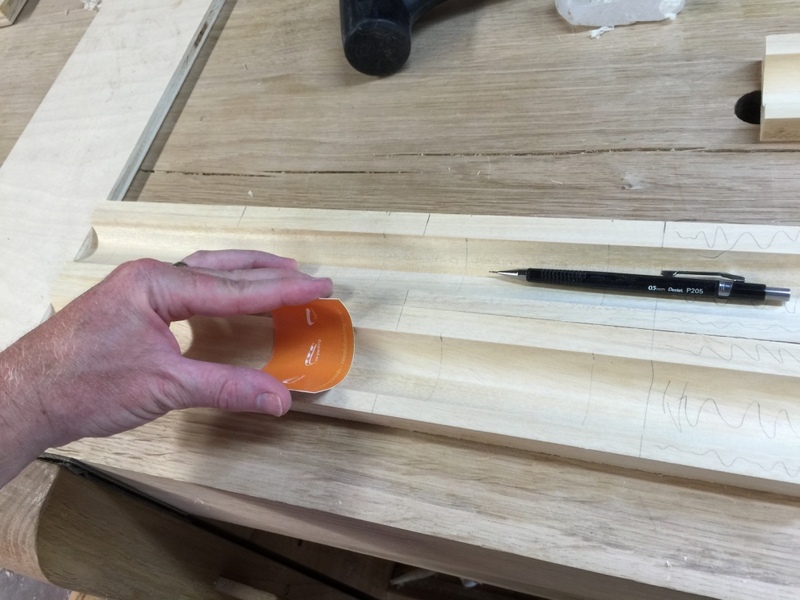 The battens are V shaped on the bottom, rising about 1/8″ from the center to the ends. 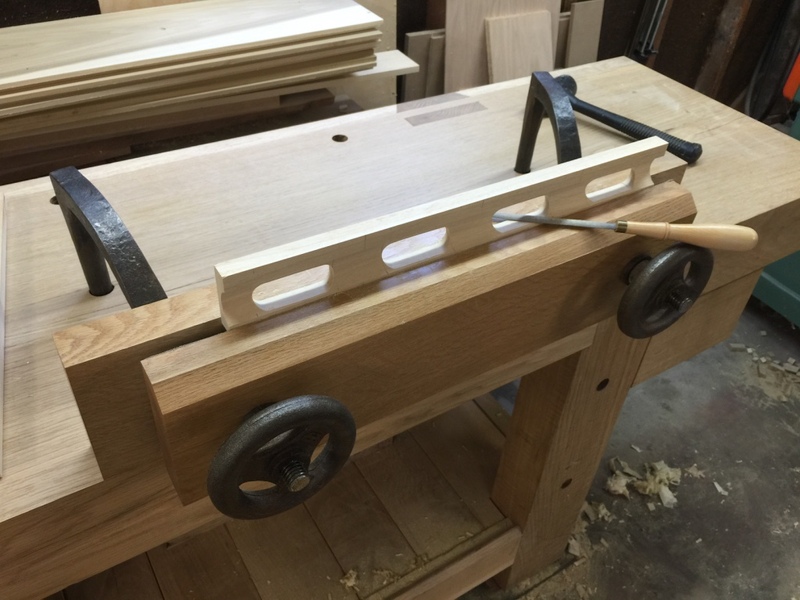 I placed the “V” in the middle and of the platen and clamped the ends to each side of the the bench, which flattened the battens to the work, ensuring consistent pressure across the clamp surface. Worked great, should have used this method on the smaller panels and saved my money on the vacuum bag! 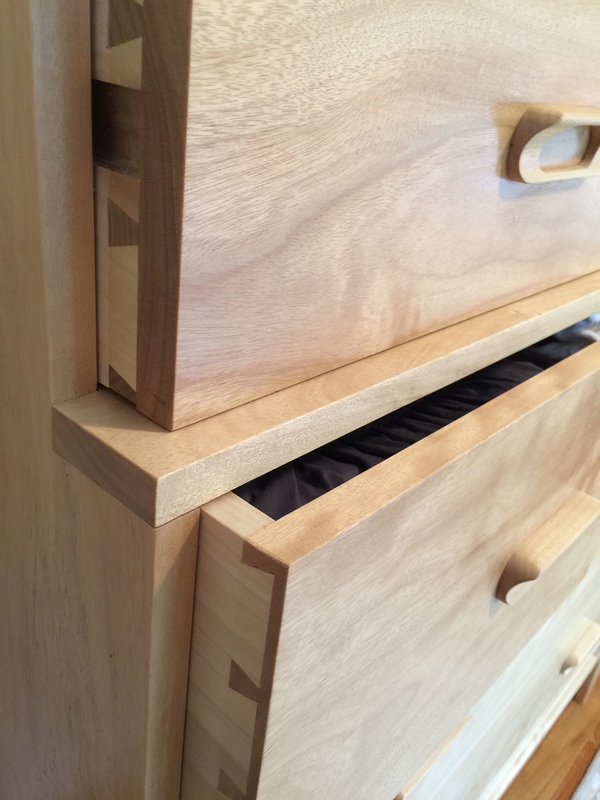 The case construction was straightforward – loose tenons and sliding dovetails. I carefully laid out the stopped grooves that the panels ride in (1/8″ deep on bottom, 7/16″ on top, cut on a router table). 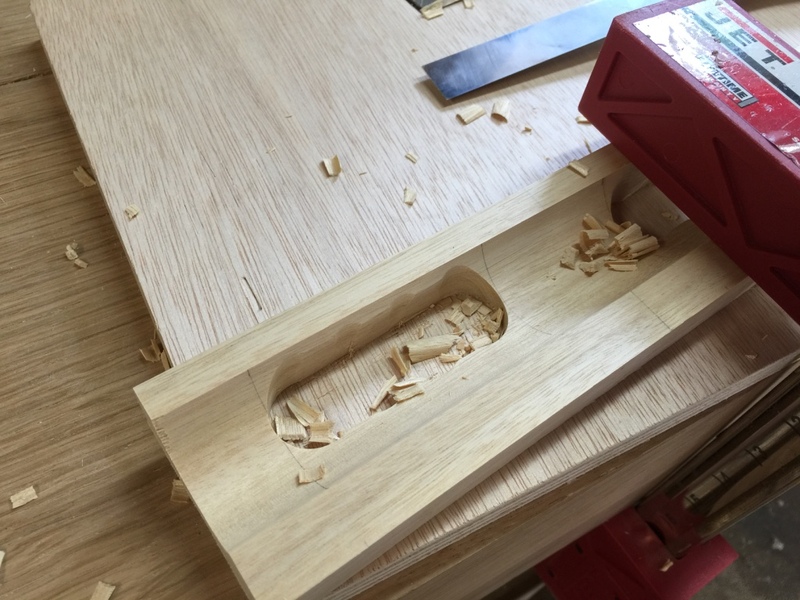 There was some trial and error cutting the door panel rabbets on a test board, but once properly fitted and lightly waxed, they glide effortlessly with very little play. Finished with boiled linseed oil and shellac and put into service! What to build next? The co-sleeper allowed me to get a few basic skills under my belt, so I was ready to determine what was going to be splintered into shape next. Clearly, the pending birth of a firstborn was not the best time to invest in new tools, but at least they were ready to go when I was a few months later. I scoured the web for ideas – furniture sites, Pinterest, and even Pottery Barn. Despite the success of the co-sleeper, Nicole was now afraid that I was going to turn our house into a gaudy collection of wooden kitsch and gimcrack. 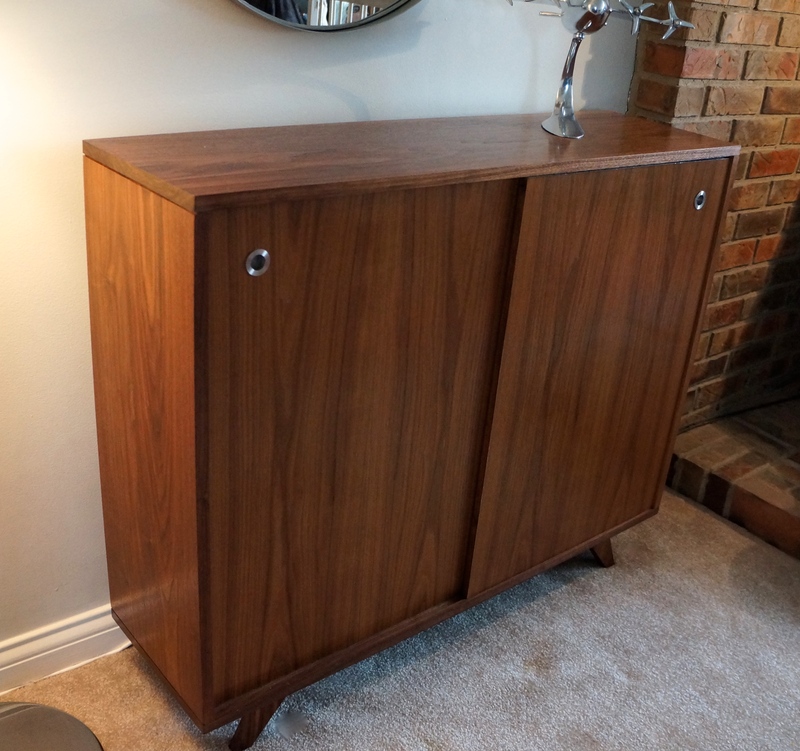 So even though this would be my first piece of furniture, there would not be much leeway – it was imperative that it complimented the mid century modern/shabby chic style that was favored in our house. Pressure = ON! On Pinterest, a stout and stylish little end table caught my eye – a mitered box nested into a simple stick legged frame. With its straight lines and minimalist modern appearance, it was a great model for a first time furniture project. I clicked on the link, and saw that the table could be purchased for a mere $800! The value was subjective of course, and though my creation would not be offered for sale in the free market, for some reason the market cost helped seal the deal. I would make a table with these lines, and it would be fashioned from walnut. 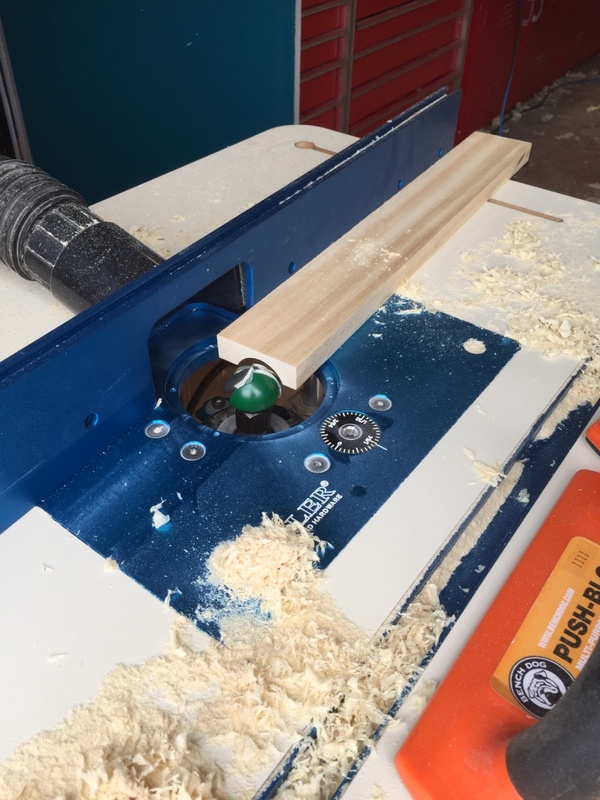 My jointer was a 6″ model (it was spring of 2012, and I was not aware of “hand” tools much beyond a cordless drill, random orbital sander, and a chisel), so my wood selection was limited to that width or less. After getting stock to the right thickness with square edges, the first step was gluing up wider boards. In hindsight, I could have done a better job working the grain to be a little more fluid around the end grain-free surfaces, but I was not sweating that level of detail at the time. The miter process ended up being easier than expected. Naturally I was concerned about having gaps in the corners, and wasn’t sure how to glue up a box that you couldn’t clamp edge to edge. 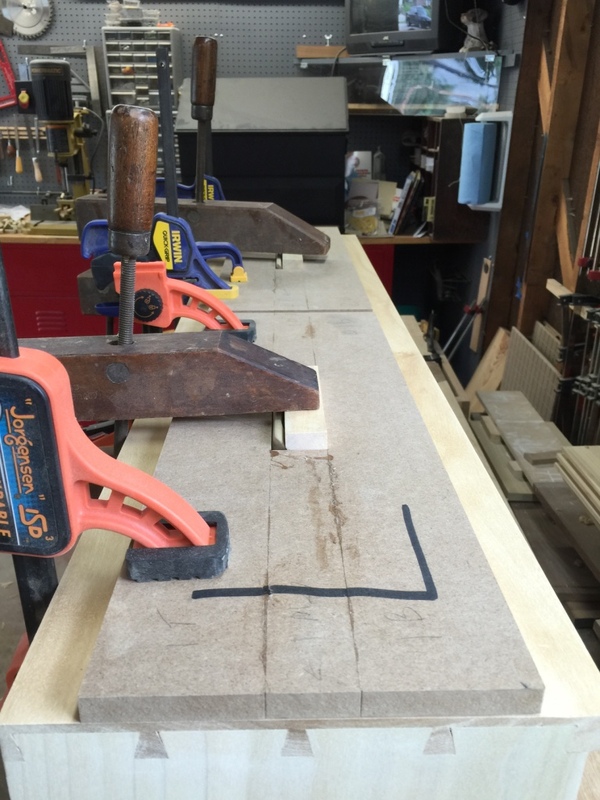 Then I came across an article in Fine Woodworking that showed how to lay the boards out flat and in order, then tape them together at the joints. 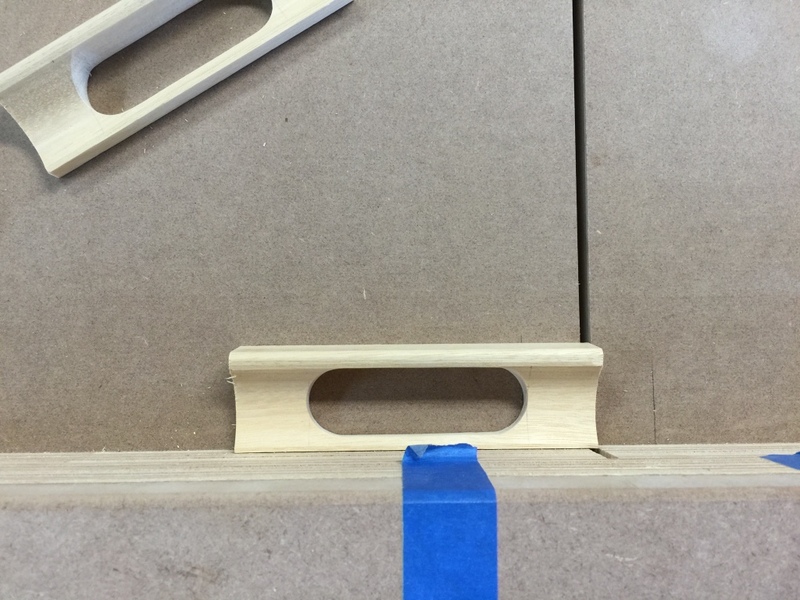 Once glue was applied to the joining edges, simply roll it up like a sleeping bag and tape the final edge together – no clamps required! Then burnish the edges with a screwdriver to close up any hairline cracks and strengthen the corner, and let cure overnight. Voila! 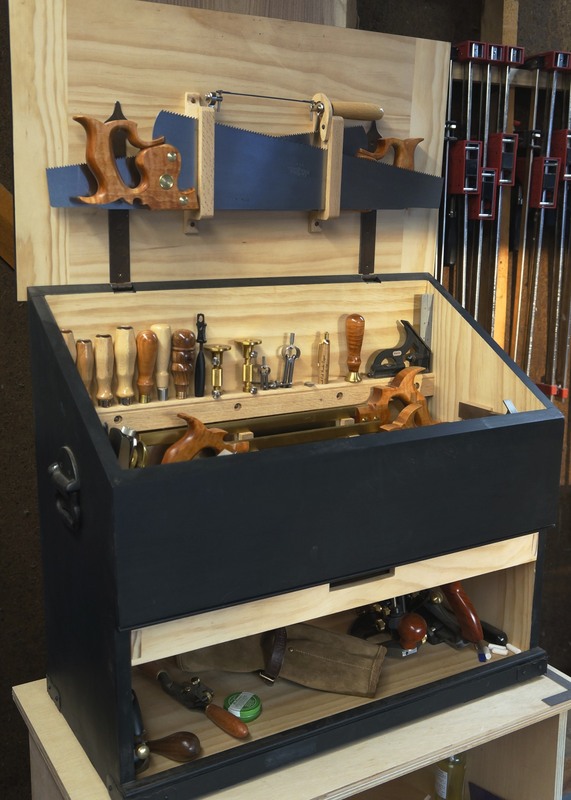 A beautiful box with tight 45 degree corners! And I even had enough insight to rabbet the rear edges to embed a back board! 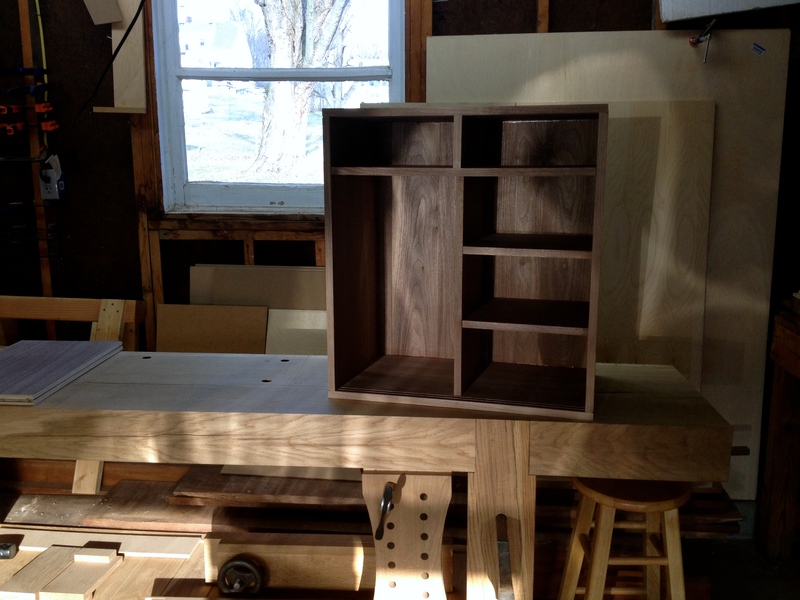 I used the box to finalize dimensions for the base, which was built with mortise and tenon joinery. The whole thing was smoothed out with my old orbiting sander, after which I applied a boiled linseed oil and shellac finish (only because Tommy Mac used this method on a recently viewed episode of Rough Cut). 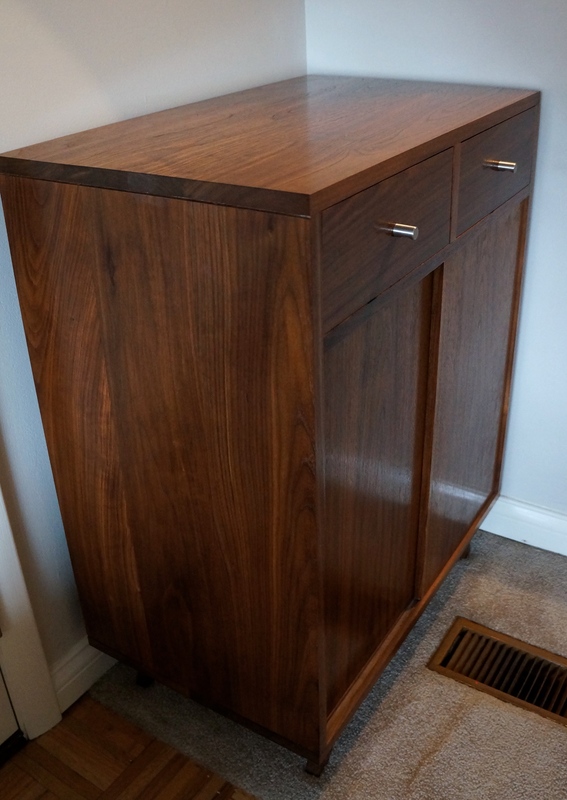 My first real piece of furniture was ready to be entered into the homestead. Over the past year, Norah has used the table for her book collection. Several times a day, books are pulled from the table and loaded back in. Despite the heavy activity, the finish has held up quite well. Having something made by your own hands influencing the look and function of a space is quite gratifying. I was now two for two on successful projects and the shop was just getting warmed up!